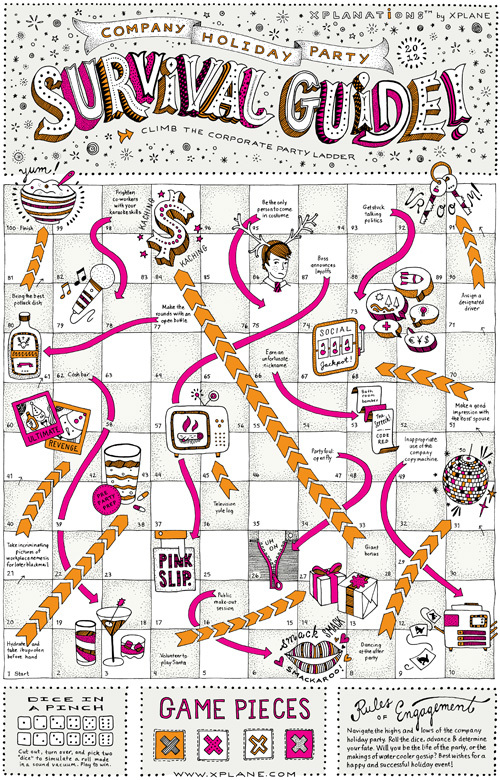 Just in time for the holidays, here is a board game illustration I did for Xplane, a Portland, OR based company that focuses on Business Design Thinking. Basically they make strategies for businesses in visual format, often resulting in interesting diagrams and infographics. 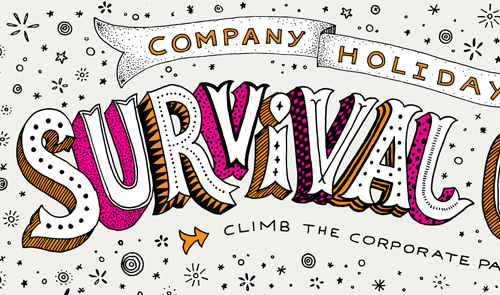 The client-provided concept was Chutes and Ladders, which was to be reinterpreted with the theme “corporate holiday party”. The piece was sent out to clients so they could fill any pre-holiday work breaks with a quick game, trying to avoid the open bottle of Jagermeister and vying to make a good impression with the boss’ spouse. Here is an 11×17 (tabloid) PDF of the game if you’d like to play as well. Try my silent dice. This was a fun project because Xplane works with a specific process that involves lots of upfront sketching and getting clear approval at each step of the project. After the initial sketch had been approved it was smooth sailing through the illustration and revision phases. Plus, my pioneer rabbit got to make a sneak appearance under the chute “inappropriate use of the office copy machine”. Poor bunny. Absolutely FAB!!!! Another masterpiece from the graphic wizard!